First, some good news on my end. I was recently invited to the University of Oklahoma to give a talk about Palestine (a version of which can be viewed here). The audience was engaged and thoughtful, and I met a ton of great people, including Dr. Charles Kimball, an ordained Baptist minister, university professor, storied public servant, and author of When Religion Becomes Evil. We managed to raise $700 at the talk through sales and donations for my friend Rania to help her get through the last few months of her husband’s incarceration in Israel on bogus charges. Many thanks to the generous people of Norman, OK.
For those who’ve been following the story, Rania’s daughter was born healthy and beautiful last month, and big brother Karim is doing well, too. Dad in prison isn’t doing so well — he’s always cold, only has two changes of clothes, is eating poorly, frequently sick, and moved between prisons constantly. Worst of all, he’s missing the second year of his son’s life and the first six months of his daughter’s life, and he can’t do anything to provide for them. Right now we have enough to keep them afloat for all but the last two months her husband will be in jail (he’s scheduled to be released at the end of July), and hopefully she can find a job before then. She’s been trying for months, and the West Bank economy is a disaster, but we’re all hoping she can manage. If not, I’ll be raising funds again in May. I just bought a one-way ticket to New York and will arrive March 11, inshallah. Can’t wait to catch up with all my New York friends. I’m also working on the last chapter of the book, which just leaves drafting the Epilogue and editing everything to perfection (or as near as I can come). There’s a lot of light at the end of the tunnel, and after two years of work, it’s a great feeling. Meanwhile, the back-breaking siege of Gaza continues, leaving the pulverized strip of land with 95% of its businesses shut down or demolished, 70% poverty rates, homes and factories unable to be rebuilt, children unable to get educational materials, and proud families ever-more dependent on erratic foreign aid. Israel has also denied scores of students with foreign scholarships the right to leave Gaza and attend college. But in a place where shocking images abound, one video hit me particularly hard. It was an interview with the headmaster of the American International School in Gaza — the only school in Gaza with an American-style curriculum that prepares Gazan students to continue their education at Western universities. 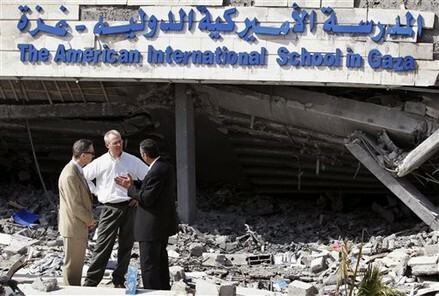 The school was bombed by the Israeli army in the final days of the assault on Gaza in early 2009. It was one of dozens of schools damaged or destroyed by the Israeli army during the offensive. Here’s the interview. It’s very hard to watch. The man responsible for this rare coverage of Gaza is Representative Brian Baird (D-WA), who is quickly becoming a hero of mine. He’s the one who, when he was arguing in Congress against the knee-jerk dismissal of the Goldstone Report, compared a photo of three young children killed in Gaza to his own twin boys. He said the hundreds of dead children in Gaza deserved, at the very least, for someone to ask why they died. He visited Gaza, saw the aftermath of the assault first hand, and decided he could not, in good conscience, be silent about what he saw. He called for Congress to cut into America’s $3 billion per year foreign aid to Israel if it continued to violate the basic rights of the entire civilian population of the Gaza Strip. Predictably, the call was met in Congress with deafening silence. But there’s better news on the international front and in Palestine itself. Brian Baird said to a group of Gaza students, ”We ought to bring roll-on, roll-off ships and roll them right to the beach and bring the relief supplies in, in our version of the Berlin airlift.” He called on President Obama and Secretary Clinton to fulfill their promise to aid the Gazans after the devastating 2009 assault, which can only happen in a meaningful way if the siege is lifted. It’s hard to over-state what a stunning turn of events this is. A US Congressman calling for a Berlin airlift. German Jews proudly choosing universal humanistic beliefs over narrow tribal interests (that aren’t even really interests — it requires labyrinths of fantastically convoluted thinking for anyone to believe the occupation is good for the Jews). Turkey putting citizens and supplies on boats heading for Gaza’s blockaded beaches, knowing that if they are fired on by the Israeli navy, it will get press coverage, and if they are not fired on, it will threaten the siege and the occupation itself. Meanwhile, non-violent activism is heating up and gaining steam in the West Bank as well. Repression of that resistance is heating up at the same time — more non-violent activists arrested without charge, more night raids into villages, and continued attacks with tear gas, concussion grenades, filthy sewage spray, and sometimes worse to break up peaceful assemblies. Since 2004, nineteen Palestinians have been killed in protests against the Wall. The excellent journalist Ben Hubbard of the Associated Press broke the story in the mainstream press (though the article has since mysteriously disappeared from the Washington Post and elsewhere… luckily it was reprinted here). CNN followed — check out the video a third of the way down the page — it’s the most honest and sympathetic to the protesters of any I’ve seen — as well as this excellent opinion piece). The New York Times, rather surprisingly, followed as well. I say surprisingly because it later came to light that the son of the New York Times‘ bureau chief in Jerusalem, Ethan Bronner, had joined the Israeli army. The New York Times did not disclose this fact to its readers until it was outed by the Electronic Intifada, an independent news source. The public editor of the NYT wrote a column suggesting Bronner should be reassigned, but the executive editor overruled him and wrote a piece explaining why. I would have enjoyed seeing what kind of piece he would have written had his bureau chief’s son joined Hamas or Fatah. Lysandra Ohrstrom at Huffington Post said it hardly mattered. 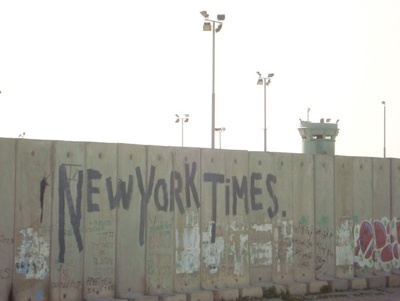 NYT’s coverage was heavily biased toward Israel long before Ethan Bronner’s son joined the Israeli army, and it would continue to be so even if Bronner was reassigned. Sadly, I tend to agree, though there are occasional cracks of light, including Roger Cohen’s always excellent columns. Nonetheless, non-violent resistance continues to spread valiantly throughout the West Bank. A recent demonstration in Bil’in to mark the five-year anniversary of the weekly protests was attended by thousands — including Palestinian Prime Minister Salam Fayyad. As Phil Weiss said on his site Mondoweiss, it’s a sign of the movement’s power that the politicians are running to catch up. It was, naturally, attacked with the usual methods. 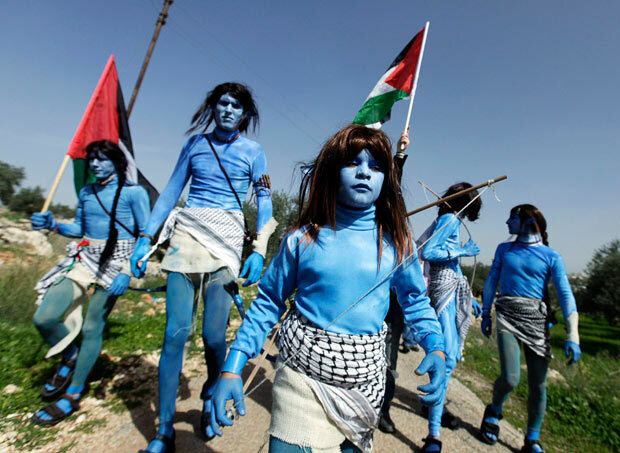 One of the coolest things I’ve seen lately was when Palestinian protesters in Bil’in dressed up as the Na’vi characters in the movie Avatar. They’re getting more creative, unified, and motivated as time goes on. The Third Intifada — hopefully a non-violent one — is a-brewing. The people of Gaza also, miraculously, continue to live and hope, as you can see here. There’s so much more going on — the botched Dubai assassination that’s getting Israel in hot water with many of its allies, the fact that the Israel lobby in America is becoming increasingly shrill and ridiculous as its narrative is questioned by more and more Americans, the visiting scholar at Harvard who called for limiting Palestinian birthrates by starving refugee children, the disgraceful “Museum of Tolerance” that Israel is trying to build on top of a Muslim cemetery, and creative protests against the occupation going on all over America and Europe. “For a long time, such accusations [of anti-Semitism] were a political death sentence for those on the receiving end of them. Even in recent years, they have remained damaging when directed at figures who were not known personally by many people in Washington journalistic circles (e.g. Walt and Mearsheimer [Harvard and U Chicago professors who wrote The Israel Lobby], Chas Freeman [who was pressured out of his post as chair of the National Intelligence Council by the strong-arm tactics of the Israel lobby]). There’s much more to say, but I really need to finish up Chapter 12. Hat tip and many thanks to the excellent blog Mondoweiss (written, for the most part, from a conscientious Jewish perspective) for alerting me to virtually all of these stories. I get most of my Israel/Palestine news from Mondoweiss these days, and I encourage everyone to check it out. FAST TIMES IN PALESTINE is an extremely powerful, deeply moving, and potentially far-reaching book that fills what is truly an unacceptable gap in popular understanding of the Israel/Palestine situation (and the Arab world in general) by giving a face to the Palestinians, so often demonized or ignored by Western press, experts, and laypeople alike. It is also a pleasure to read. Olson is a sympathetic and relatable narrator who, like many readers, has very little knowledge of the Middle East beyond news blurbs and stereotypes before she travels there herself. She skillfully guides readers through her travels and encounters, gradually building on our knowledge of the region so that, by the later parts of the book, she is tackling complex political and historical issues in a way that is accessible to all. Although some critics may argue that she is clearly beholden to Palestine, I found that her comments were generally balanced and well-researched, and her time deliberately spent in Israel and among Jewish friends prevents her story from seeming too one-sided. The book also succeeds as a tender and fascinating portrait of a culture about which generally very little is known (and much is misunderstood) in the Western world. Discussions of cuisine, garb, architecture, daily prayer, holidays and festivals, family structure, relationships, leisure activities, women’s rights, and the Koran are seamlessly woven into Pamela’s well-crafted personal narrative. Her account is rife with intimate and evocative descriptions of the places she visits and memorable portraits of the people she meets along the way. Olson has also put together a clear and convincing submission document, including an explanation of the book’s unique purpose, simplified chapter summaries, and an analysis of the current market and competition for her book. I think that this project would fit in well at our agency and I highly recommend pursuing it. It’s a promising start. And it’s amazing to know that at least one discriminating reader had precisely the reaction I was hoping for when I started writing this book more than two years ago. It will find its place, inshallah. Onward and upward. I’m working on the last section of Chapter 11, about the Gaza Disengagement in 2005. I was in the Gaza Strip when the last soldiers and settlers left. It’s a difficult thing to write about, as one man knows very well. His name is Chris Hedges, a former Middle East bureau chief for the New York Times who writes more honestly about this region than almost anyone I’ve read. Keep in mind that he’s writing here about the most extreme part of the most extreme place in the Palestinian territories. The world he describes would be alien to most people in the West Bank outside of Nablus and perhaps Hebron, and even to most families in better-off Gaza City. But the fact that this world exists, or ever existed, is a stain on the conscience of mankind and will remain so until the occupation is ended, with liberty and justice for all. The artist Joe Sacco and I are driving up through the Jerusalem Hills to Beit Agron, the government-run press building. Beit Agron was the first place I visited in 1988, when I moved to Jerusalem as the Middle East bureau chief for the Dallas Morning News. I had no office, no staff, and no experience in the Middle East. I had arrived from Lausanne, where for four months I had studied Arabic. My teacher, an Egyptian, used to write on the board phrases such as “The Arabs are good. The Jews are bad.” I later took the Hebrew University conversational Arabic course, taught by a kind and gentle Palestinian professor, Omar, who became a close friend. Arabic is a delicate and beautiful construct. The language is poetic, magical, with calls and responses, ornate greeting and salutations, for everything from eating to entering a house. When someone brings you food you say, “May God bless your hands.” If offered a coffee you say, “Coffee always,” meaning may we always drink coffee during moments like this. Seven years later, now the Middle East bureau chief for the New York Times, I had spent 600 hours of study and reached the conclusion that mastery of Arabic was a lifelong pursuit. A little of it, though, goes a long way. After being captured by the Iraqi Republican Guard in Basra in 1991 during the Shiite uprising following the Gulf War, I was able to recite a string of bad Arabic jokes and talk about my family. I wrote Omar a thank-you note when I was released. In the name of Allah the Merciful, the Great Sultan, King of the Turks, Arabs, and Persians, Suleiman son of Selim Khan – may Allah make His Kingdom eternal – gave the order to build this blessed Wall. Beit Agron is a dirty yellow stucco affair in the center of Jerusalem with tiled floors and poorly lit corridors. It has the feel and smell of a public high school. The reporters and photographers whose lives intersected mine here more than a decade ago are mostly gone now. Some I see only rarely, bumping into them in various shattered corners of the globe; others are dead. The stories we worked to tell, which flashed briefly across a screen or a front page before receding from the public’s consciousness, are, for us, still vibrant. A shooting at a road junction in Gaza – a brief item on the wire – remains hard to retell. Years later we recount the mishaps, the funny anecdotes that, taken at face value, made our life a romp. The real stuff is alluded to only in brief, almost codelike asides and silences. It was in Gaza, where I lived for weeks at a time during the seven years I spent in the Middle East, that I came to know the dark side of the Israeli Defense Force. During the first Palestinian uprising, begun in December 1987 and ended in 1993 with the Oslo peace accords, the army had little interest in crowd control. It fired live rounds at boys hurling rocks. And on a few occasions the Israeli soldiers, angered at the coverage, turned their weapons toward groups of photographers and cameramen. They shot rubber bullets into their legs – doing it with a self-congratulatory arrogance that came to define the occupation for me. In Beit Agron I run into familiar Israeli press officials. They are efficient: our press cards are ready in minutes. They welcome me back. They ask about New York. They hand out cell-phone numbers and tell us to call if we need assistance. Joe and I get up to leave, but we are blocked at the door by a man in his early sixties wearing a gray leisure suit. His name is Yusuf Samir, and he is a reporter for the Israeli Arabic service. He tells us that he was kidnapped recently in the West Bank by Palestinian gunmen and held for several weeks. The Israeli press officers are beaming. I fall asleep in the taxi to Gaza, and Joe rouses me when we come to the Erez checkpoint, in the north of the strip that separates Gaza from Israel. Erez is deserted. The multilane highways that once allowed goods and traffic to travel back and forth now resemble unused runways. The low sheds and warehouses, once used to corral Palestinians as they waited for buses to take them into Israel, are vacant. Israeli soldiers hunker down in concrete bunkers, the black nozzles of their machine guns poking out between the sandbags. Gun battles between Palestinians and Israelis are frequent here, especially after dark. I hoist on my body armor, which has the word PRESS emblazoned across its front. The twenty-six pounds of Kevlar plating make me feel as if I were wearing a body cast. We approach the Israeli office, where our passports and press cards are checked and our luggage is screened. I mount our bags on a little wheeled cart, the kind you use in airports, and pull it behind me as we walk the quarter mile of empty asphalt to the Palestinian side. High concrete walls hem the lanes. I will drop to the ground next to these walls if firing breaks out. We cross the checkpoint at about 4:00 P.M. At the last Israeli guard post, the blue-and-white flag with the Star of David on a pole overhead, the young soldiers peer out and tell us jokingly to have a nice trip. I point to the word PRESS on my chest. “Shoot me here,” I say, laughing. And then I point to my head. Joe and I share a room at the Dierra Hotel in Gaza City, overlooking the Mediterranean Sea. The Dierra Hotel was built after Yasser Arafat returned to Gaza in July 1994 to set up the Palestinian authority under the terms of the Oslo peace agreement. His limited rule was, most hoped, meant to lead to a two-state solution. The assassination of the Israeli Prime Minister Yitzak Rabin scuttled any chance of that. Over the last 15 years Arafat has become isolated and unpopular, largely because the promised economic improvements and freedoms have not materialized. Only his refusal to accept the mutated statelets offered to him at Camp David has saved him from complete pillory. The hotel is thus a symbol of what should have been, an airy, elegant palace of domed roofs, muted sienna stucco walls, deep blue tiles, and balconies looking out at the Sea. It resembles, with its arched doorways, the beach hotels in Tunisia. In the fall of 2000, after the Islamic militants burned down all the liquor stores in Gaza and all the hotels that sold alcohol, the Dierra Hotel hastily padlocked its bar. Wine can still be ordered discreetly. It is served in white teapots. There are small screw-top wine bottles in the refrigerator in our room. But the hotel has the feel of a proper Islamic establishment. Arafat senior officials gathered here in the evenings to sit on the terrace with their wives and girlfriends, few of whom sport traditional head scarves. Without Azmi, many doors remain shut. I am grateful that he has agreed to accompany us to Khan Younis. We sit looking out to sea. Azmi has a tea. The black silhouette of an Israeli gunboat lies menacing and still on the horizon. Joe and I lift our body armor into the small trunk of Azmi’s car, where Azmi keeps his own vest and a television camera, and head down the coast road for Khan Younis. Azmi beats the wheel with his fingers and hums along to a tape of the Egyptian singer Abdel Halim Hafez. He keeps urging us to look at the coast; he himself drives with his head turned to the side, watching the rolling white surf, praising the sea. We weave around trucks and buses. One must trust Allah and Azmi’s horn – used in lieu of brakes – when one climbs into Azmi’s small, yellow car. The gaiety of our drive is cut short when we reach the Israeli-controlled junction at Abu Holi, about fifteen miles outside of Gaza City. The landscape here is lunar. For acres around, fields have been bulldozed, houses demolished, and olive trees felled and hauled away. In the distance sits a conical cement tower manned by Israeli soldiers. On either side of the checkpoint long lines of cars wait to cross. The coast road is the only way to get to southern Gaza and Khan Younis, and at this point it crosses a highway used by Jewish settlers and the Israeli army. When the settlers speed by in their white armored cars, all Palestinian traffic is stopped. Weeks can pass with the intersection closed or the soldiers letting through only a thin trickle of traffic. One of Azmi’s friends, who lived in Khan Younis and worked in Gaza City, gave up trying to make the commute and moved in with friends in Gaza. Azmi shuts off his tape player. He insists that everyone open a window. We do not speak. We unbuckle our seatbelts. In all war zones everyone needs a door and a swift way to roll out onto the ground if shooting breaks out. We creep forward in the stop-and-go traffic until we face the tower. Azmi leans forward over the wheel. He narrows his eyes and concentrates on a disembodied hand poking out of a slit in the bulletproof glass. The flat palm means stop. A bad read, a lurch past the tower when the Israelis do not want you to move, could see your vehicle raked by gunfire. Suicide bombers, who conceal explosives in donkey carts, view spots like these as prime targets. We do not move. We wait. Finally the hand behind the thick Plexiglas flutters, motioning us through. Azmi, sweating now in the heat, begins to drive cautiously over the speed bumps. Joe sketches the scene in his notepad. We cross the settlers’ road – Palestinians are not allowed to use it – and pass the long line of cars waiting on the other side. It is several minutes before Azmi agrees to roll the windows up and restore the air-conditioning. None of us feels like talking. Khan Younis is a dense, gray, concrete shantytown, the black waters from sewers running in thin rivulets down the middle of alleys. There are no gardens or trees. There is no place for children to play, other than the dunes in front of the neighboring Israeli settlements. Vendors in small, dingy stalls sell roasted corn on the cob or falafel. Hunks of meat hang on giant hooks alongside wooden tables piled with tomatoes, potatoes, green peppers, and green beans. During the rains the camp floods with wastewater. Crude septic tanks, called percolating pits, lie outside homes, covered only by a thin layer of sand. When the pits overflow, the dirty water may slosh into the dwellings. The drinking water, which often does not flow for more than a couple of hours each day, is brackish and brown. It has left many in the camp with kidney problems. Only the lonely minarets, poking up out of the clutter, lend a bit of dignity to the slum. The latest intifada erupted in September 2000, when Ariel Sharon, then the Israeli opposition leader and now the prime minister, visited the al-Aqsa Mosque, one of the holiest sites in Islam, with about 1,000 Israeli police. Arafat pleaded with then prime minister Ehud Barak to help stop the visit, fearing the violence that would surely erupt, but Barak could do nothing. Since then nearly 500 Palestinians have been killed, along with 100 Israelis and a dozen Israeli Arabs. Khan Younis is one of eight refugee camps in Gaza. It is surrounded on three sides, like a horseshoe, by Israeli military positions. The soldiers there fire down on the roofs of the concrete shacks – asbestos mostly, held down by piles of rocks, cement blocks, and old tires. Bands of Palestinian gunmen, who often initiate the shooting, fire back. A blistering white sun beats down on the camp. Our shirts become damp. Our shoes are soon covered with dust. We walk in single file through the concrete maze, jostling our way past groups of Palestinians. Finally we are afforded a look at the dunes hugging the camp. They are dotted on top with Israeli gun emplacements, sandbagged bunkers, large concrete slabs, and a snaking electric fence. Armored green jeeps and tanks roar and clank along the fence’s perimeter, throwing up clouds of dust. Knots of nervous Palestinians stand gazing in the direction of the behemoths until they pass out of sight. The walls of the houses facing the settlements, especially in the El Katadwa neighborhood, on the western edge of the camp, are pockmarked with bullet holes. Jagged chunks of masonry have been ripped away by tank fire. Barrels filled with sand and stacked one on top of the other – for me, an eerie reminder of the Balkans – deny Israeli snipers a view of the streets. Beyond the fence we can see a mobile crane, from which dangles a yellow metal box draped with camouflage. It lumbers inside the Israeli compound like a jerky robot. I am told that the snipers fire down from the box while suspended over the camp. We turn down a crowded alley and come upon a group of older men seated on chairs in a patch of sand, playing backgammon. A black plastic water tank and a TV antenna loom over them. A radio, perched on a window ledge behind metal bars, plays Arabic music. At dusk these men, and the families that live along the perimeter, will move deeper into the camp to seek safety with relatives and friends. Bands of Palestinian gunmen will creep up to shoot at the Israeli positions, and the crackle of automatic fire will punctuate the night air. The Israeli positions on the dunes virtually surround the Jewish settlements, whose whitewashed villas and manicured lawns and gardens look as if they have been lifted out of a southern California suburb. Inside the fence are warehouses where cheap Palestinian labor once stitched together clothes for export or tended rows of vegetables in huge greenhouses. We set off to find Fuad Faqawi, who runs the United Nations Relief and Works Agency (UNRWA) for Palestinian Refugees office in Khan Younis. Azmi leads us down one narrow passage and up another. We finally find the dwelling, a low concrete house surrounded by a cement wall, and bang on the metal door. Faqawi greets us in a short-sleeved shirt and black loafers covered with a thin film of dust. A packet of Parliament cigarettes pokes out of his shirt pocket. He leads us under a corrugated roof that shades worn chairs and stools, their legs thrust into the sand. He clutches a walkie-talkie. Faqawi was born in Khan Younis, which was established in late 1949 to provide aid to the some 200,000 Palestinian refugees who had fled the advancing Israeli army in 1948, an army that pushed displaced villagers toward Gaza. Like most refugee camps, Khan Younis was at first a vast tent city, a temporary encampment, set up for 35,000 refugees until people could return to their homes. The tents were replaced in 1953 by boxy concrete structures. The Egyptians, who first controlled Gaza, would not allow the camp to expand, nor would the Israelis, who gained control of Gaza after the war in 1967. Although roughly the same size as it was in 1949, Khan Younis now houses almost twice the number of registered refugees – 58,891 – that it did five decades ago. The population growth rate for the Palestinians is one of the highest in the world – 3.7 percent compared with 1.7 percent in Israel. This is, simply, one of the most heavily populated spots on the planet. The Palestinians in Gaza, 1.1 million of them, most of whom lack the means to leave, live in a 147-square-mile area. Twenty percent of that territory belongs to the sixteen Jewish settlements, home to about 6,000 Jewish settlers. In other words, one fifth of Gaza is in the hands of 0.5 percent of the people who live there. Faqawi says that there was a point two decades ago when UNRWA, which runs schools and health clinics and distributes monthly sacks of flour and food, seemed as if it might have outlived its purpose. By the late 1980s some 40 percent of the men in the camp had jobs in Israel as menial laborers, and unemployment in Gaza was relatively low. The pay was not great, but it allowed them to buy food, televisions, and refrigerators. Israel’s decision to impose restrictions on tens of thousands of workers during the first uprising, and a further curtailment when Arafat supported Saddam Hussein in the Gulf War, reversed the gains. Unemployment is now 40 percent, up 11 percent from last year. The U.N. estimates that one in three Palestinians lives on less than $2.10 a day. Palestinian economist Samir Hulaileh estimates that more than two thirds of the Palestinians in Gaza will be living below the poverty line by the end of this year. The average family in the camp receives five kilos of lentils, five kilos of rice, five kilos of sugar, two liters of cooking oil, and fifty kilos of flour a month from UNRWA. There are 837,750 registered refugees in the Gaza Strip, 54.6 percent of whom (457,426) live in camps. “Oslo meant almost nothing in practical terms to the people in Khan Younis,” Faqawi says. His small yard is filled with children, as ubiquitous in Khan Younis as grains of sand. They stand barefoot, their faces dirty, as they watch us sip demitasse cups of coffee. The smaller ones wear only ragged shirts. The children move in aimless bands throughout the camp, stealing, scavenging, cursing, smoking cigarette butts, and falling into rock-throwing wars. Wealthier Palestinians tend to keep their children indoors. Faqawi darts into his house and brings out a worn pouch. He tenderly unfolds sepia documents. The papers, from the government of Palestine, then a British mandate, permitted Faqawi’s father to sell tobacco and food in his grocery in Jaffa. He holds out the Register of Lands document, issued under the land settlement ordinance of 1928, that proves title to his father’s house. As a boy growing up in the camp Faqawi lived with his eight brothers in a tiny concrete shack. His family built a new structure on the foundations of the old one about fifteen years ago. The boys shared one bedroom. He had no shoes, no schoolbooks, and was plagued by disease and insects. As we speak, a homemade mortar, launched a few blocks away, rips through the air. It, or one fired later, is sure to bring an Israeli response. Groups of Palestinian men and boys are already at the dunes throwing rocks at the Israeli jeeps patrolling the Gani Tal Jewish settlement. The soldiers will open fire and wound eight Palestinians, five under the age of eighteen. At about the same time in Halhoul, a town north of Hebron in the West Bank, Israeli soldiers will wound seven Palestinians, including two medics. The shooting will take place as Palestinians try to dismantle a barricade, built by Israeli soldiers, across the main road leading into the town. Faqawi goes into his house again, a cigarette dangling from his mouth, and returns with twisted scraps of Israeli munitions, including black, dartlike needles known as fléchettes. The fin-tailed fléchettes are packed inside shells and spray out in a deadly mass when the shells detonate. Three women in Gaza were killed by fléchettes a few days ago. He looks at his two sons, who grimace when he speaks of compromise. He stops, his eyes weary. I sit in the shade of palm-roofed hut on the edge of the dunes, momentarily defeated by the heat, the grit, the jostling crowds, the stench of the open sewers and rotting garbage. A friend of Azmi’s bring me, on a tray, a cold glass of tart, red carcade [hibiscus] juice. In the morning we attend the boy’s funeral. It is easy to find. Trucks with mounted loudspeakers tour the camp urging resident to attend and giving the street address. Going to funerals is a prerequisite of covering conflicts. I have been to countless. In many places I have had to inspect the bodies and faces to verify or refute claims of torture and mutilation. The boy’s father, Murad Abdel Rahman, stares vacantly as he stands up from one in a long line of purple plastic chairs placed in the street and shakes the hands of mourners. Posters of his dead son adorn the walls. Black flags of mourning, green banners with Koranic verses, the yellow flags of the Fatah militia, and signs from Palestinian factions surround the white canopy that has been spread out over the rutted, dirt street. I shake his hand. I offer my condolences. We incline our heads together to talk. The small body lies a few feet away. It is hard to concentrate. The frail form of the dead boy, wrapped in a shroud, reminds me of my eleven-year-old son. I was in a room once in Kosovo with a mother and her children shortly after her husband was murdered by the Serbs. The man’s young son kept looking at the photo of his father on his identification card and weeping. I want, as then, to flee. I want to go home to my children. A truck, manned by militants, is parked at the end of the street. The bearded Islamists in white robes wait to turn the funeral into a rally. The boy’s body will be the prop. It is a familiar act. Martyrs, especially child martyrs, are a potent weapon in the hands of radical groups. It is hard to argue with death. Nationalists in Bosnia or Kosovo, insurgents in Central America, made a great show of funerals and the remains of those who were sacrificed for the cause. The father says that he had no part in the decorations, which include posters of Saddam Hussein. He seems indifferent to the display. He speaks slowly, his puffy eyes and uncomprehending gaze giving the lie to the rhetoric of sacrifice and glory. Several small boys stand glumly on the edge of the tent. They say they had called to Ali as he walked home to join them on the dunes. During the funeral, sixteen-year-old Aadel Hussein al-Muqannan, who was wounded with Ali, is pronounced dead at Nasser Hospital in Khan Younis. He was shot in the abdomen; the bullet severed his aorta. Aadel’s fifteen-year-old brother, Hussein al-Muqannan, was killed by Israeli troops on November 22, 2000, at the Tuffah checkpoint at the edge of Khan Younis. The residents in the camp insist the Arabic accent is Lebanese. They believe that mercenaries from the South Lebanese Army, once a Christian proxy army for Israel and long a bitter foe of the Palestinians, have been integrated into the Israeli force. The word in Palestinian Arabic meaning “to shoot” – ahousak – is never heard over the loudspeakers but rather the Lebanese word in Arabic, atoohak. And the Palestinians in the camp say that they can hear Lebanese music coming from the guard posts. Ali’s small body is loaded onto the back of a truck. A cadre of young men, some bearded and in robes, others dressed in black and wearing wraparound sunglasses, march in three rows, with automatic weapons pointed in the air, behind the bier. The crowd of several hundred, egged on by the speakers mounted on the truck, chant Islamic and anti-Israeli slogans. The truck, with a generator in the back to power the loudspeakers, lumbers ahead of the procession. Posters are displayed of young martyrs, often holding clunky machine guns in front of a backdrop of the al-Aqsa Mosque. These boys probably never owned a gun or saw the mosque in their lives. The chanting crowd passes the murals and graffiti that smother the walls of the camp. One shows an Israeli bus, marked by a Star of David, smashed and on fire. “Don’t be merciful to those inside” reads the slogan underneath. “Blow it up! Hit it!” Hamas has signed the mural. Another shows masked Palestinian gunmen, AK-47 assault rifles strapped to their backs, loading a mortar to fire on a settlement. One mural shows a pile of yellow skulls, all marked with a blue Star of David. On one wall the skeleton of a settler has been painted hanging from a post. Nearby a huge hand thrusts a knife into the Star of David. Many walls list the names of the thirty-seven Palestinians killed in Khan Younis since September. Every new death pushes the voices of moderation deeper into the background. Azmi, who has Israeli friends, says he no longer speaks of them for fear of being branded a collaborator. Those moderates who keep open the channels of communication are often the first to be silenced by their own side. As in most conflicts, all dialogue has been reduced to a scream. Fahdi Abu Ammouna, thirteen, lies on a bed in the al-Amal Hospital, his feet propped up on a pillow. Dried blood covers the sheets. He says that some of his rocks hit the army jeep, though I doubt he or any of his friends could throw that far past the electric fence. She begins to talk about the first uprising, which led to the Oslo peace agreement. Her husband, Samir, stands in a blue shirt, white pants, and sandals at the end of the bed. He was a prisoner then in Israel. One morning Israeli soldiers burst into her two-room house in the refugee camp while she was baking bread. Her son was six months old. They turned the place upside down and threw the boy on the stove. He was severely burned. As she speaks she gently places her fingers on his small arm, now hooked up to an intravenous tube. Before we leave, we visit the office of Dr. Mahmoud al-Madhoun, the hospital’s director. He hands us plastic bags filled with bullet fragments he has taken out of his patients. All have the dates, the types of wounds, and the names of the victims printed neatly on the outside. Of the 1,206 killed and wounded, he says, 655 were under the age of eighteen. He cannot understand why soldiers would fire at children. We want to spend a day in Mawasi, a Palestinian village cut off from Khan Younis and surrounded by the Israelis. I call the army press office in Jerusalem and ask permission for Azmi, Joe, and me to cross the Tuffah checkpoint at the edge of town. It is agreed that we will be allowed to pass through the check-point at 11:00 in the morning. We walk down the sloping asphalt road to the bleak Tuffah crossing. (Tuffah means “apple” in Arabic.) Behind me rises the El Katadwa neighborhood. Mounds of rubble, the remains of thirty-nine houses demolished by Israeli bulldozers in April, are interspersed with green tents and black plastic water tanks mounted on wooden frames. This was the first incursion by the Israelis into land that had, under Oslo, been given back to the Palestinians. Nervous groups of Palestinians stand a few hundred yards from the checkpoint. The slogan “We will shield the al-Aqsa Mosque with our bodies from the Zionist enemy” has been spray-painted on the wall next to them. Straw, oil-covered sand, and crushed soda cans litter the road. An Israeli helicopter passes noisily overhead. The Palestinians wait for the loudspeaker order to come forward in clusters of three. Only those who live in the coastal village of Mawasi can pass. All must have special Israeli identity cards. As the groups of three approach the concrete guardhouses, all lift their shirts to show that they are not hiding weapons or explosives. The women pull up their veils to expose their faces. Dogs trained to sniff out explosives root among suitcases and boxes. Many Palestinians clutch clear plastic bags filled with food or flour. They hold up the bags so that the soldiers can prod and inspect them. Mohammed al-Magida waits to pick up vegetables grown by farmers in Mawasi. The tomatoes he loaded yesterday were left too long in the sun by the Israelis and spoiled. He has been here today for two hours. On the other side are crates he hopes to have passed to him by hand. But the soldier with the dog that sniffs the produce is not around. “A lot depends on the mood of the dog,” he tells me. Many items, such as bags of cement and propane tanks, are simply banned. No vehicles, save those of the Israeli army, are permitted to drive back and forth. Pregnant women in labor, held for hours at the checkpoint, often cannot get to the hospital in Khan Younis; two have given birth at the checkpoint. When someone dies in Mawasi the corpse must be carried across for burial in Khan Younis on someone’s back. Ibrahim Abu Awad, a dirty and disheveled boy of ten, pesters me for a shekel, and finally stands and stares intently at the post. I ask him what he wants to do in life. A soldier barks an order in Arabic over the loudspeaker for Azmi, Joe, and me to approach the post, one by one. We enter a corridor of plastic barrels filled with sand. We pass through a metal detector. Coils of concertina wire spread out around us. I hand our Israeli press cards through the slit in the guardhouse. The area around the guardhouse is blackened by soot. The fence is a tangled mass of wire. This damage is the result of a suicide bomber who blew himself up at the post in May. After the explosion an accomplice threw grenades at the soldiers before being shot dead. The pictures of the two dead men cover the walls in Khan Younis. Mawasi, with some 5,000 villagers, was split from Khan Younis in 1972 when the Israelis began to build the Neve Dekalim settlement, one in a chain of eleven small settlements along the Gaza coast that include a tourist hotel, a golf course, and horse-riding trails. The Palestinian who live in the village are prohibited from using the modern highway that runs north and south – it is only for the Jewish settlers and the army – and must travel along a one-lane asphalt track that runs parallel to the main road. Mawasi has most of the good farmland in the area. But the closure left the fields fallow. Khan Younis once depended on Mawasi for 80 percent of its produce, and some 60 percent of the crop used to be shipped to the Gulf states. Now only a pittance gets out. Once through the checkpoint we proceed down the narrow lane past heaps of rotting garbage. For the last eight months, Israel has refused to allow the Khan Younis municipal authorities, which are in charge of garbage collection on this side as well, to cross Tuffah. Relations between the Palestinians in Mawasi and the settlers have never been good. But last January, Palestinian gunmen murdered a settler and escaped in the settler’s car. The settlers then went on a rampage. The settlement appropriated another 200 dunams (about 45 acres) of land after the killing and erected an electric fence around the barren brown fields. Ahmed Moustafa al-Magida, an imposing man of fifty who is one of the leaders in the village, insists that we take a look at the losses. We pile into his car and tour the area. All around us are confiscated fields, the blackened remains of Palestinian greenhouses, the charred hulks of tractors and farm carts. One Palestinian home has been gutted by fire. Electricity has been cut everywhere. Tonight, with the lights of the settlements shining above them, the residents of Mawasi will gather around wood-burning fires. We decide to visit the beach, negotiating another Israeli checkpoint to do so. Mawasi has seen its fishing industry shut down. The small huts and shacks where Khan Younis residents once sat to drink Coke and swim in the surf are deserted. Fishing boats, the fiberglass hulls cracked from disuse, clutter the sand. We come upon five fishermen who returned to their boats three days ago after eight months of being denied entry; the Israelis have promised to allow limited fishing near the coast. Joe picks up a small shell on the sand and notices that it has a hole in it. We decide to make a necklace for my daughter. When Kana sees us searching in the sand, as well as Azmi’s impatience with our frivolity, he wades into the surf. He scoops his hand into the water and emerges with dozens of glistening white shells. He dumps them into a plastic bag for us. Later, when the Israeli soldiers pull us out of the car, they will poke deep into this bag, not sure what to make of it. On our way back to Khan Younis, Joe and I stop at the settlement and peer through the chain-link fence at an Indian worker driving a tractor mower across a lawn, skirting the sprinklers. We ask the soldiers for permission to enter and are told that we must speak with a settlement official. We stand in the sun, gazing at the emerald lawns and the palm trees. Azmi waits for us down the road at a bus stop. Finally we are handed back our Israeli press cards and told to leave. As we cross into Khan Younis, ambulances are leaving the dunes with eight more wounded, five under the age of eighteen. It is the end of the day, but we have made plans to visit a factory. Nearly all commerce in Gaza has been shut down. The 12,000 Palestinian workers from Khan Younis who had jobs in Israel and the 2,000 who worked in settlement factories are now unemployed. The inexpensive piecework done in Palestinian shops may still be sent abroad, but raw materials no longer arrive. The textile- and furniture-factory floors are empty. As night comes on, Dosouki and his neighbors have an even more pressing concern: water. The water in Khan Younis, when it is available, is salty and riddled with chlorine. Ten of the town’s twelve wells do not meet World Health Organization purity standards. Because of the violence at night, public-works employees often refuse to man the pumping stations at the edge of the settlement. In Mawasi many wells have gone completely dry, but the Israelis refuse to allow the villagers to drill new ones. This Arafat loyalist – he had a huge portrait of Arafat on the wall behind his desk – said that in general his city is nearly bankrupt. Revenues have fallen from $250,000 to $80,000 since the Intifada began in September 2000. Salaries of public officials are paid only with assistance from the Gulf states. The mayor, who is fluent in English, was just seven when his father was killed in the 1967 war. The body was never found. He worries that the current round of violence will lead, as it has in the past, to war. The mosque dominates camp life. Five times a day, including calls before dawn and after sunset, the amplified chant of the muezzin lends a coherence and rhythm to existence here. Islam has squeezed out the secular, urban-educated Palestinian leadership in Gaza. In places like Khan Younis, Arafat’s Palestinian Authority bows to the militant’s interpretation of Islam. There is no alcohol sold in the camp. There are no cinemas. Women, even those who are not religious, find it prudent to walk the streets with their heads covered. Special Islamic reconcilers settle disputes and blood feuds. The militants, imbued with religious zeal, are intolerant of anti-Islamic practices, but they are also widely respected for being honest, in stark contrast with Arafat’s bloated and bribe-ridden government. Shop owners complain of having been forced to pay kickbacks to local Arafat officials in order to do business. Landlords say that Palestinian Authority officials rarely pay rent on stores or apartments. Many of Arafat’s officials have set up lucrative businesses importing duty-free goods, including cars, and selling them at huge profits. In the afternoon we visit the cramped office of an Islamic charity that provides food to families in Khan Younis. The room is filled with young bearded militants. A truck has backed up to a warehouse next door, and men are unloading sacks of flour, sugar, and rice, as well as red lentils, tea, macaroni, tomato paste, and corn oil. The charity, which raises its money in the Gulf states, is not officially tied to the militant Islamic group Hamas. But it is here, I have been told, that I will meet Sheikh Younis al-Astal, the camp’s senior Hamas leader. He enters dressed in a white robe. The men in the room fall silent. He speaks, as so many Hamas leaders do, in an even, gracious tone. He offers me tea or coffee. Arafat loyalists in the camp, such as Faqawi, concede that Hamas is ascendant. If Oslo had led, as many had hoped, to a two-state solution, and thereby given Palestinians some glimmer of a better life, it is a fair bet that Hamas would be a marginal force in Gaza. But Israel’s occupation and Arafat’s mismanagement have made it only a matter of time before the militants come to power. They already rule the street. If Sharon unleashes Israel’s might, as he did in Lebanon, the Palestinian Authority will be his first victim. Hamas is primarily known outside Israel for its suicide-bomb attacks against Israeli civilians. The sheikh tells me that Hamas orders suicide bombers, under its military wing, the Iz al-Din al-Qassam, to attack Israeli civilian targets because Israeli troops and armed settlers routinely attack Palestinian civilians. From 1987 to 1993, during the first Intifada, Hamas targeted only Israeli soldiers and settlements. It began to attack individual Israeli civilians after a Jewish settler, Baruch Goldstein, gunned down twenty-nine Muslim worshipers in the lbrahimi Mosque in Hebron. But these attacks have had the added benefit of discrediting and weakening Arafat’s authority, of exposing his helplessness in the face of settlement expansion, closures, and the shooting of unarmed Palestinians. Still, even the sheikh has used his time during Friday prayers to implore the young boys not to go out on the dunes. The gun battles on the rim of the camp at night have fused the various factions. The Fatah Hawks, who once battled Hamas activists for control of the street, now swap weapons and ammunition with their old foes. The factions march together at funerals. We meet next with one of the leaders of the gunmen who fire on the Israeli positions at night. Mohammed Abu Rich, thirty-one, leads the Ahmed Abu Rich brigade, which is made up of a couple dozen men. The group is named for Mohammed’s brother, shot in November 1993 by the Israelis. He meets us in his house, a huge painting of his brother on the wall surrounded by three Palestinian flags. He tells us that he spent six years in an Israeli prison. His parents died while he was incarcerated. He has no family left. He swings from polite conversation to a thinly veiled hostility. I am uneasy. For the only time in Gaza, I hand over my Swiss passport when asked for identification to avoid being judged as an American. He writes down our names and our passport numbers – Joe uses his Maltese passport – in a school notebook. I have seen his type before in Bosnia, Kosovo, the Congo, and Central America. Driven by rage and somewhat intoxicated with the authority carrying an automatic weapon can bring to the dispossessed, these are the combatants I fear the most. They are always looking for hostages, sure we are all spies. During the first Intifada, a group of Fatah Hawks hauled New York Times photographer Rina Castelnuovo and myself into a room and accused us of working for Israeli security. We were lucky to talk our way out. As often happens in such encounters, I am soon the one being interviewed. He asks me what I think of the conflict, which Palestinians I have met with, where I have been in Khan Younis, and what I think of Israel. I mutter brief and tepid answers. Odds are that the next time I arrive in Gaza I will hear that this man has been killed. Sabha Abu Mousa, fifty-five, picks through the shattered tiles and stones that were once her home in the neighborhood of El Katadwa. She is searching for her daughter-in-law’s two gold bracelets. She and her husband ward off packs of scavengers, most of them young boys. In one of the few gutted buildings that remain standing after the April attack, a ceiling fan, its blades shredded, hangs tenuously by a wire from what is left of the roof. The attack left the fifteen people who lived in this woman’s small house homeless. They have moved into two rooms in an unfinished housing project where they have no running water or electricity. She pauses and looks toward the settlement. “All will vanish in the end except Allah,” she says. The small boy’s room, which he shared with his brothers, is now a pile of stone and plaster. There is shooting again at the dunes, though the only injury occurs when a fourteen-year-old boy suffers a fractured skull after being hit in the head by an Israeli tear-gas canister. I watch Jihad Abu Mousa, twenty-two, kick at a few pieces of rubble. He is morose and silent. He has a closely cropped beard, wears blue sweat-pants and a green shirt. He quit high school to work as one of the 2,000 Palestinian laborers in the settlements. He earned $10 a day tending vegetables in the greenhouses, arriving at work at 6:00 in the morning and leaving at 3:00. On January 29 his twenty-three-year-old brother Mohammed was shot dead by Israeli soldiers while, Jihad says, playing a game of soccer. Jihad, considered a security risk, lost his job. “I worked for them for two years,” he says. “They have quite a life — nice cars, big houses, yards, hot clean water, and electricity, not like us. But they treated me well. I have nothing now.” He stops, the familiar thousand-yard stare of despair and incomprehension creeping across his face, the look beaten into him, beaten into his father and his father’s father and, no doubt, if he has children, a look that will be beaten into them. Joe and I cross back over Erez, our heavy body armor slung over our shoulders. I pull our bags behind us on the cart, which bounces over the pitted asphalt. We shove our bags through the metal detectors. We give our passports to a female Israeli soldier seated behind a long wooden counter. She hands each of us a slip of paper. She tells us to carry the slips to the last guard post into Israel. We walk into Israel and enter the vast, empty parking lot next to Erez. We climb into an old taxi, which we have arranged to meet us, and start for Jerusalem. The wide expanse of highway, the gleaming gas stations, the roadside restaurants, the stucco homes, the lush valleys filled with vineyards and crops, seem shockingly unfamiliar now. It is not long before the ancient Mercedes gives out. The driver, an Israeli Arab, cannot budge it out of second gear. When he tries there is a loud bang. The car shudders. The pace is excruciating. He does not want to let us go. He talks about being met on the road by another car from his company, about waiting a little longer to see if the wreck will come back to life, about how little we have to travel until things will be fixed. I lose my patience. I insist he let us off at a bus stop on the highway, where a group of young Israeli soldiers, M-16 assault rifles slung over their shoulders, stand waiting for a ride. We hitch a ride with two nuns in a van. The sisters run health clinics in Gaza. They speak in French, the common language of their religious order. As we rise steadily toward the Jerusalem hills, the banter reminds me of another era, when the educated upper classes in the Middle East were taught French. One may still stumble onto elderly French-educated doctors and intellectuals in Cairo or Damascus, but that world is all but gone, replaced with American slang and McDonald’s. The afternoon light casts a soft golden glow over Jerusalem, on the crest of the hill before us. It is hard not to be moved by the city, by all that it has endured and will endure. It has seen its share of zealots, those who killed in the name of causes now forgotten. They, too, believed that they were faced with an insoluble human dilemma. I have been invited to dinner with a friend, a surgeon, and his family in their affluent home in West Jerusalem. His father fled Vienna for Palestine shortly after the Nazis took over Austria. They are liberal Israelis, no friends of Sharon and no friends of the growing religious right. They support the creation of a Palestinian state. I worry about them every time a suicide bomb explodes in the city. At the table I try to make them grasp, just for a moment, what I felt watching the children on the dunes in Khan Younis. I tell the story. They admit that it is wrong, and then add, “But you have to understand, the Palestinians are brain-washed.” I concede the point, hoping only to impart the raw cruelty of what I saw. I try again. I fail. I fall silent. It is late when I leave. I walk toward the center of Jerusalem. The night air is a welcome relief after the summer’s heat. I am glad to be alone. I pass in and out of patches of light and dark cast by the periodic streetlamps. My shoes are covered with the dirt of the camp. War has an alluring simplicity. It reduces the ambiguities of life to blacks and whites. It fills our mundane days with passion. It promises to rid us of our problems. When it is over many miss it. I have sat in Sarajevo cafes and heard that although no one wished back the suffering, they all yearned for the lost spirit of self-sacrifice and collective struggle. War’s cost is exacting. It destroys families. It leaves behind a wasteland, irreconcilable grief. It is a disease, and in the night air I smell its contagion. Justice is not at issue here: war consumes the good along with the wicked. There will be no stopping it. Pity will be banished. Fear will rule. Chris Hedges was the Middle East bureau chief for the Dallas Morning News, based in Jerusalem, from 1988 to 1990. He was the Middle East bureau chief for the New York Times, based in Cairo, from 1991 to 1995.